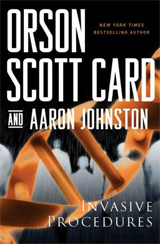 My first novel, which I coauthored with New York Times bestselling author, Orson Scott Card. The book is based on a screenplay I wrote that was based on a short story Scott Card wrote. It sounds complicated, but suffice it to say that Scott Card and I expanded his original story into something I’m very proud of. Dolores never met a Healer she didn’t like until the night they took her away. It happened at the playground on Santa Monica Beach at about two o’clock in the morning. Dolores slept in the metal tube that connected the jungle gym to the swirly slide. For a homeless woman of forty, it wasn’t that bad of an arrangement. She had privacy here, and the garbage cans at the playground usually had enough juice boxes or snack packets to tide her over until morning. A passerby would, no doubt, think Dolores older than her forty years. Time on the street had a way of aging a person in much the same way war did. Her greasy brown hair hung in knotted clumps beneath a black knitted cap. Her eyes were gray, distant, and tired. Years of wind and sun had leathered her face and left dark circles under her eyes. Beneath her heavily soiled trench coat were several layers of other clothing: T-shirts and sweatshirts and all kinds of shirts—far more than normal people would wear but just enough for someone who slept out in the cold. Tonight the cold was especially cold, the kind that snaked its way into Dolores’s metal tube and then into the holes and folds of her clothing. It was a cold that had kept her up all night. And by the time the uninvited drunk man arrived, Dolores was in a particularly sour mood. He stumbled into the playground, smelling like a vat of cheap liquor. From where she lay, Dolores couldn’t see him, but he was making plenty of noise and sounded like trouble. Go away, she wanted to scream. Take your booze smell and the vomit smell that’s bound to be right behind it and go away. Instead he collapsed onto the slide, and the metal rang with the sound of his impact. Dolores inchwormed her way to the end of the tube and looked down. There he was, sprawled on his back in the sand, his arms spread wide, his mouth slightly agape. He must have slid right off the slide after falling onto it. Whatever you been drinking, mister, you must have burned a lot of brain cells, because no poorly buttoned flannel shirt and holey pair of blue jeans are going to protect you from this wind. You need layers, peabrain. Layers. She wriggled back inside the tube. Not dressing for the weather was about the stupidest, most inexcusable reason for dying Dolores could think of. She was debating whether to move elsewhere for the night just in case drunk man here woke up and caused trouble, when she heard voices. It was a man’s voice, strong, probably a cop. Good. Get that stinking heap away from my slide before he throws up. Of course he’s drunk. You got a clothespin on your nose? “He’ll do,” another man said. An older man, by the sound. And quieter. Like somebody used to being obeyed without having to push. The kind of person who shouldn’t be in an empty playground on the beach after dark, in the winter. She knew the smart thing to do. Lie low, don’t make a sound. They obviously hadn’t noticed her. And that was always a good thing. “Help him to the van,” the older man said. The van? Cops don’t take drunks “to the van.” They either book them or roll them. So who were these guys? She had to get a peek. If she moved really slowly, she could keep silent. Then again, if she moved too slowly, they’d be gone before she got to the end of the tube where she could see. So she needed just the right balance of speed and stealth. Got it wrong. They must have heard her, because someone started climbing the ladder. Dolores’s grip tightened around her tennis racket. She’d never be able to swing it, of course. There wasn’t room. But she could at least raise it warningly if she had to. It was the old man. White hair. Trim white beard. And a smile so wide, you’d think he had just walked into his own surprise birthday party. Dolores kept silent. If she ignored him, he might think her crazy and leave. Always better not to take chances with a stranger than to open one’s mouth and let them hear the fear in your voice. “A little cold to be sleeping outside, don’t you think?” the old man said, lifting a hood over his head as the wind picked up. It was the hood that gave him away. He was a Healer. Only Healers wore capes with hoods like that. It was their calling card. Dolores thought the capes and hoods rather silly-looking but understood that they were more functional than fashionable. The cape was like a flag, a neon sign, drawing anyone who needed a Healer directly to one. It said, Hey, I’m a Healer. Come to me if I can help you, and I gladly will. They were the Good Samaritans of the street. Healers made it their mission to give out free food and to treat people who were sick or injured—getting in trouble sometimes because they had no medical licenses, but not in really bad trouble because nobody could ever prove that they were actually practicing medicine and because they only helped the homeless anyway, people who couldn’t help themselves or get help anywhere else. The only thing odd about this Healer, however, was his age. Dolores had never seen an old Healer before. The ones she had seen, strolling along the Third Street Promenade helping the homeless there, were all young, healthy, bodybuilder types. Big guys. Always guys. And always big. Muscle big. Don’t-mess-with-me-because-I-can-break-your-face big. But this Healer was anything but a young Arnold Schwarzenegger, though he didn’t look particularly weak. “You’ll freeze to death if you stay out here,” he said, still smiling. Dolores kept her expression blank but was inwardly happy to see him. Free food was free food. The only catch was that Healers could talk your ear off if you let them. Wellness of the body and soul and all that, helping the species reach its potential. Whatever. Dolores didn’t care what religion they were preaching. She just listened and pretended to care, until they gave her the food. Then she’d politely thank them and be on her way. “I’m George Galen,” he said. As if that was supposed to mean something to her. Maybe he was waiting for her to tell him her name, but she wasn’t about to, so she got to the point instead. “You got any food?” she said. Dolores craned her neck a few inches, just enough to see who it was he was speaking to. A young Healer—the normal kind of Healer, with big bulging muscles and wearing one of those capes over his shoulders—nodded and hurried away. Another Healer had an arm around the drunk man and was helping him hobble away from the playground. Dolores rolled her eyes, not caring if the old man noticed. Crazy religion mumbo jumbo. They waited there in silence a moment until Lichen came jogging back with a sandwich in a small plastic bag. He handed it to Galen, who handed it to Dolores. She unwrapped it and began to eat. It was good. The Healers always had good stuff. Turkey, yes, but lots of lettuce and tomato, too, and sprouts, and mayo—a real sandwich, the kind somebody might pay for, not the slapped-together crap that homeless people usually got. “Thank you,” she said. She might be gutter trash to most people, but she still had manners. That didn’t mean she was a pushover, though. “I’d rather skip the sermon if you don’t mind,” she said. Galen tilted his head back and laughed again. As he did, Dolores saw a glimpse of the gold ribbon stitched on the inside band of his cape collar. All Healers had some color there, she had noticed, usually red or blue. It surprised her to see a Healer laughing. All the ones she had ever talked to were stiff as boards and always spoke in reverent tones, like the street was a chapel getting ready for mass. He laughed again. He was a jolly one, there was no questioning that. She even smiled back this time. The street had given her edge, but the charm of this George Galen was melting that away like warm sunshine. She even considered apologizing for not wanting the sermon. He beat her to the punch. A warm bed. A soft one. And more food. “Free of charge?” she asked. Galen obligingly descended. Dolores wriggled out and carefully climbed down after him. They drove north along the Pacific Coast Highway. That was the first bad sign. Dolores had assumed they’d be heading back into LA, toward downtown, where a lot of the nonprofits had their offices, not north toward Malibu. She was sitting between Hal and some other guy. Hal, she had learned, was the drunk man who had collapsed at the playground. Galen had asked him his name rather nicely when they had pulled over to let him throw up. If Dolores thought he smelled bad before, it was nothing compared to the odors he was giving off now. No hot meal is worth this, she thought. At least the homeless kid on her left wasn’t drunk. He seemed pretty normal, in fact. Fifteen or sixteen at the most, with black stringy hair tied back in a ponytail and thrashed black combat boots. Most punks his age would be running at the mouth and complaining about something. But not this kid. He just stared out the window and kept to himself. “I’m Dolores,” she said. The idea of free food and a warm bed had suddenly put her in a good mood. Nick returned his gaze to the window and said nothing. So much for polite conversation, thought Dolores. Behind her, sitting alone in the very back seat was another boy, Nick’s friend, also homeless by the looks of him, with the face of a junkie if Dolores had ever seen one. Kid probably wasn’t a day over fourteen, although the drugs made him look much older. He had shaggy black hair, wore a tattered trench coat, and sported a tattoo of a snake, which began somewhere under his collar and extended up the side of his neck. “Your friend Nick don’t talk much,” said Dolores, turning in her seat to face him. “Not much to say, I guess,” said the boy. “I’m Jonathan,” the boy said. You and me both, thought Dolores. You and me both. Up in the passenger seat, Galen sat whistling and tapping his fingers on the armrest. The driver was one of the big Healers, possibly the biggest Dolores had ever seen, nearly seven feet tall and thick as a horse. Unlike Galen, he seemed on edge, both hands on the steering wheel, leaning forward slightly as if the van wasn’t going fast enough for him. The Healer named Lichen sat behind Galen near the sliding door. He wasn’t nearly as large as the driver, but he was big enough to make Dolores wonder how many hours a day he spent in a gym. “Where’s this place we’re headed?” Jonathan asked. “Seems awful far,” said Nick. Well that sounded right tasty to Dolores. She couldn’t remember the last time she had pot roast. Nowadays it was just whatever looked edible, put it in your mouth and chew. Don’t ask what it is. Don’t ask where it came from. It’s got nutrients you need. So eat it. Yes, sir. I could go for some juicy pot roast about now. The van immediately pulled over and the door slid open. Hal was out in flash, dry heaving over some sagebrush. Dolores wasn’t sure which kind of vomiting sounded worse, wet or dry. “Shouldn’t drink so much,” said Galen. “You don’t say,” said Hal. Dolores shook her head. This was downright unappetizing. “You’ll feel better once we get some coffee in you,” Galen said. Hal nodded. “Just give me a second.” He was still on his knees on the asphalt as he bent over and retched again. If it weren’t for the soundtrack, you’d think the guy was praying. It was pathetic, really. Dolores couldn’t help but feel sorry for the man. Hal stayed there for the longest time, not moving. The other two Healers didn’t like this one bit. The driver kept looking at his watch and then up the road, like he was expecting someone or had an appointment to keep. Lichen stood outside with Hal, standing over him like a fidgety prison guard. “It’s late, sir,” the driver said. “Fine,” Hal said. Then he slowly got to his feet. Galen got out of the van and helped him back inside. It was kind, the way the old man treated him—paying no attention to the smell and not minding having to touch his filthy clothes. Like the Lord, Dolores thought: reaching out and healing the blind and the lepers. They hadn’t driven two miles when they pulled over yet again. This time for a hitchhiker. Are we driving or not? Dolores wanted to scream. All this talk of pot roast has worked up a hunger. Let’s get a move on. Dolores thought him a scruffy-looking fellow. Byron carried no bags, but he looked like a drifter. Three-day beard. Dirty blue jeans. A baseball cap with the Mack truck logo on the front. A denim jacket. The door slid open, and Byron climbed in, taking a seat behind Dolores, next to Jonathan. As soon as Lichen had the door closed, Stone had the van in gear and on the road again. “Your car?” Galen asked, as if he was surprised the man owned one. Dolores caught Stone, the driver, eyeing Byron through the rearview mirror with a look of suspicion, like he suspected him to be trouble. “We heal what needs mending,” said Galen. They passed two all-night gas stations, and Byron asked to be let out both times. “Don’t be silly,” Galen said. “It’s warmer at the shelter. You’ll be much more comfortable there.” When they left the Pacific Coast Highway and started driving up into the mountains, Dolores got nervous. Galen said nothing. Nor was he whistling anymore. After a half a dozen turns up unlit roads, the van pulled onto a gravel drive. Finally, Dolores thought. Finally we’re going to stop. This driveway can’t be long. But it was long. They drove for another ten minutes, twisting and turning, the tires grinding the gravel. Dolores was beyond nervous now. She was the only woman in a van of six men, more than a day’s walk from the pier. She shouldn’t have agreed to go. She should have stayed in the cold. This was too far away, too strange. She gripped the tennis racket tucked in her bag between her feet. She wanted to make a break for it, push Hal and Lichen out of the way, slide open the door, and jump. “I want to get out,” Nick said. Then the gravel road widened and they pulled up to a building. The driver stopped the van and Galen turned around to face them. “Here we are,” he said. They all looked out the window. Dolores’s heart sank. This was no shelter. And no home either. She turned back and saw that Lichen was holding a gun, or something that looked like a gun. “Everybody out,” he said. Beside her, Nick began to cry. Copyright © 2007 by Orson Scott Card and Aaron Johnston.